Technology is enabling supermarkets and other retailers to change their prices throughout the day, but why should they want to do this and what will customers think about it? Many know the dispiriting feeling when the summer holiday flight they had their eye on suddenly goes up £50, or the Uber they call on a Friday night is four times the price they paid the day before. This is known as "surge" or "dynamic" pricing - when the cost of an item is dictated by demand. And while it's common in the hospitality and travel sectors, the high street has generally stuck to the fixed-price model. But now, digital displays coupled with the analysis of vast amounts of customer data is enabling retailers to change the cost of hundreds of thousands of items instantaneously and play with prices in real time to attract specific types of customer at precise times during the day. In the US for example, Coca-Cola has been using Google's cloud platform to send videos and discount coupons to customers' smartphones in Albertsons grocery stores. Digital signs encourage shoppers to find the soft drinks aisle, where they are then targeted with personalised special offers and content based on their online browsing habits and spending profiles. While some see this as an invasion of privacy, the industry sees it as a good example of "location-based" marketing coupled with dynamic pricing. So in future, the prices you are offered in-store might be for you and you only. "We can understand who the consumer is and get the right content and messaging to him or her at the right time," Greg Chambers, global group director of digital innovation for Coca-Cola said at a Google conference earlier this year. "We're using the power of the cloud to bring a real-time, media-rich experience to shoppers in the store." And this dynamic pricing trend could be coming to the UK. Last year, Marks and Spencer conducted an electronic pricing trial where sandwiches were sold at a discount in the morning to encourage shoppers to buy their lunch early. While the company isn't currently planning to do this more widely, it comes as several of the large supermarkets are trialling the idea. Sainsbury's says it ran an electronic pricing trial two years ago - but wouldn't say what conclusions it reached - while Morrisons and Tesco are each currently trying out the system in one of their stores. They all say that the aim behind the scheme isn't to bring in dynamic pricing, but don't deny that it will make switching between prices easier. Electronic pricing means supermarkets "will be able to flex their prices a lot more", says Neil Mason, European analyst at market research firm Mintel. "Retail is really tough nowadays - you've got to be quick to respond and e-pricing is the way to do that," he says. "It's about being more efficient and responsive to what is happening in the marketplace. "They might want to increase prices on certain products because of inflationary pressure, but also might want to decrease prices because of promotions - so it could be good for consumers. "At the end of the day supermarkets have to be keen on price competition, especially now the big discounters have entered the sector." In the UK, an intense price war between the discounters, Lidl and Aldi, and the "big four" - Tesco, Sainsbury's, Morrisons and Asda - as well as growing competition from online retailers such as Ocado and Amazon, has taken its toll on profit margins. On top of that, food prices are rising as inflation pushes up the cost of imports, something that supermarkets are loath to pass on to their customers. Meanwhile, those customers are feeling the pinch as wages fail to keep up with the cost of living. In this context, perhaps it was only a matter of time before electronic pricing made the move to UK retail, an area that is constantly looking at ways to innovate. Displaydata, one of the world's leading suppliers of electronic shelf labels, confirms that electronic pricing's newfound popularity in the UK has transformed their Berkshire-based business. Chief executive Andrew Dark says: "It's fascinating for us because up until the last 12 months we have been a UK company that was effectively a 100% exporter. "This phenomenon has been building in Europe and the US and has now arrived on our shores, which is great. I think there are a number of reasons, not least that UK retailers are very conscious of their consumers." Mr Dark estimates that if the technology were implemented in every store, 10 million prices could be changed within 24 seconds, not only speeding up the process but helping to cut food waste and making pricing more accurate. "I think most major retail outlets will move to this over the next five years - it's a global trend, not just a UK trend." Electronic displays like Displaydata's can be operated remotely using wireless technology from a single server and a computer at the retailer's HQ. Alongside changing thousands of prices simultaneously, shops can use the labels to convey information about stock availability, social media reviews and, as in the case of Coca-Cola in the US, connect with smartphones to send customers targeted promotions. Toby Pickard, senior innovations and trends analyst at food and grocery research charity IGD, agrees digitalising price labels has many benefits for big supermarkets, once they get past the initial set-up costs. "Retailers will be able to gain more data about the products they sell. For example, they can closely gauge how prices fluctuating throughout the day may alter shoppers' purchasing habits, or if on-shelf digital product reviews increase sales in-store." 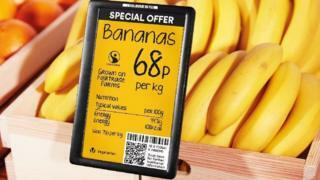 Digital pricing could also help persuade customers to buy new products. "By making fixtures stand out more, they can encourage customers to try new products and make impulse purchases," says Mr Pickard. "Systems like this could encourage further customer interaction through smartphones, change messaging by time of day, and perhaps offer dynamic pricing." The big unknown is how we consumers will take to the idea of uncertain prices in an already uncertain world.